Thai authorities said Tuesday they were hunting a man shown on security footage strolling into a packed religious shrine wearing a bright yellow T-shirt and leaving a backpack before an explosion killed at least 20 people. The attack occurred on Monday in one of the Thai capital's most popular tourism hubs, ripping through a crowd of worshippers at the Hindu shrine close to five-star hotels and upscale shopping malls. At least 11 of the victims were foreigners, with Chinese, Hong Kong, Singaporean, Indonesian and Malaysian citizens among the 20 confirmed killed, police said. More than 100 other people were injured in the blast that left body parts, shattered glass and incinerated motorcycles strewn across the crushed concrete of a busy intersection. 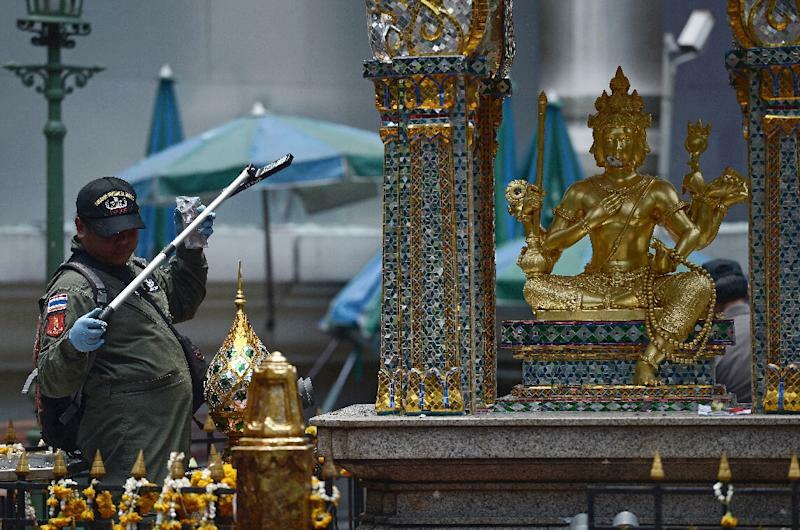 Junta chief Prayut Chan-O-Cha on Tuesday branded the bombing the "worst ever attack" on Thailand, and said the hunt was on for the suspected bomber filmed on closed circuit television at the shrine. 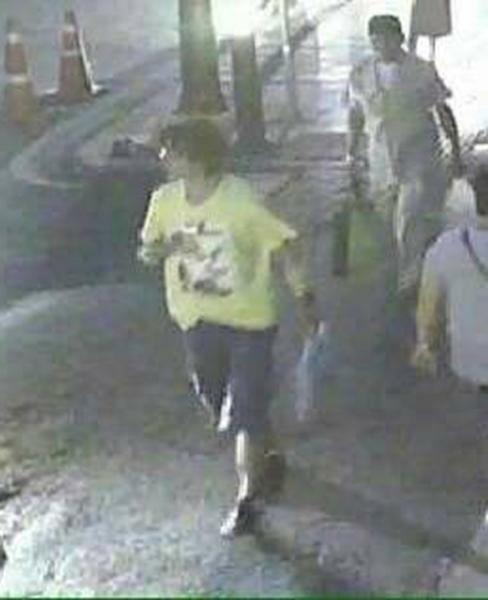 Police released images showing the man, who appeared young, slightly built and wearing a yellow T-shirt and dark shorts, walking into the shrine with a backpack. He sits down and places the backpack underneath a bench, then walks away from the shrine clutching a blue plastic bag while reading what appears to be a smartphone. National police spokesman Prawut Thavorn said the man left the scene aboard a motorcycle taxi, which are common in Bangkok, and the blast occurred three minutes later. "It is quite clear that he is the perpetrator in this case," Prawut told local television station Channel 3, adding police were also trying to track down the motorcycle taxi driver. But Prawut and other security chiefs did not reveal if they had any motives for the attack. Adding to the tensions, a small explosion occurred near a busy Bangkok train station on Tuesday afternoon, with the device landing in a canal and sending a large plume of water into the air. Police said nobody was injured. Bangkok has endured a decade of deadly political violence amid a power struggle between the military -- backed by the middle class and elite -- and the poor led by populist politician Thaksin Shinawatra. He is living in self-imposed exile after being deposed as premier in 2006. The junta has ruled the nation since May, 2014 after toppling the elected government of Thaksin's sister, Yingluck. Bangkok's power struggle has generated repeated rounds of deadly street protests and bombings for nearly a decade. But anti-junta groups have never conducted such a large attack, nor one that was apparently aimed at a tourist zone. And with no one claiming responsibility for Monday's strike, political and security experts said there was no obvious culprit. Zachary Abuza, an independent expert on Thai security, told AFP he doubted it was in the interests of the anti-junta groups to carry out such an attack. "Even if they are hell-bent on bringing down the government I just can't see them targeting a Hindu or any other religious shrine," Abuza told AFP. "That would really alienate many of their supporters." Muslim rebels from the country's far south have also waged a separatist insurgency for more than a decade that has claimed thousands of lives, mostly civilians. But they have never been known to carry out substantial attacks in Bangkok, and Abuza as well as other analysts said Monday's bombing did not follow the insurgents' typical modus operandi. Paul Chambers, director of research at the Institute of South East Asian Affairs in Thailand, said groups with links to military factions also had to be considered as potential suspects. Various Islamic militant groups have also carried out many attacks in other parts of Southeast Asia, including on Indonesia's holiday island of Bali in 2002 that killed 202 people. But they have not made Thailand a prime target. Junta leaders said the bomb was clearly aimed at damaging the country's tourist industry -- a rare bright spot in an otherwise gloomy economy -- and tarnishing the junta's reputation. "(The attackers) had the clear target of destroying our economy and tourism... and discrediting the government," Defence Minister Prawit Wongsuwon told reporters. Thailand's baht currency slumped to a more than six-year low on Tuesday, and shares fell on the Bangkok bourse over concerns the attack could damage the tourism sector. While Thailand's tourism industry has bounced back after previous bouts of political unrest, analysts say the latest attack may prove a more formidable challenge. Thailand had been expecting a surge in Chinese visitors in October for the annual National Day holiday. That is now in doubt after the attack claimed the lives of four mainland Chinese and two people from Hong Kong. According to China state media, 19 Chinese were also among the injured. British authorities also confirmed a Hong Kong resident with a British passport was killed. 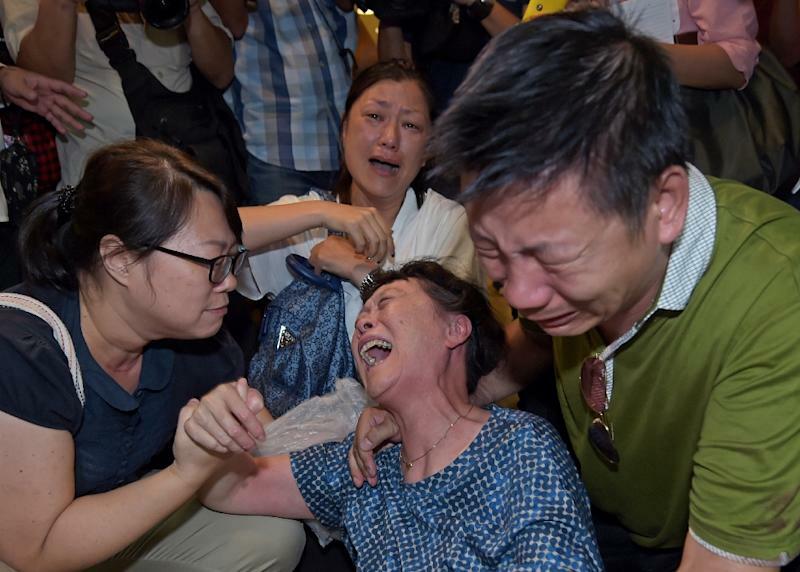 It was not immediately clear if she was a dual national already counted among two Hong Kong victims. Thais walking near the blast site on Tuesday expressed fear about more potential violence in the coming days. "I'm worried about Bangkok, I don't know what will happen next," one woman, who gave her name as Rivewan, told AFP.